Welcome to the Damask Divas blog hop for June featuring the Timberline paper pack. If you got here from Brenda’s blog, you are in the right place. You can always go back to the Damask Divas blog by clicking here if you want to start at the beginning or view the Damask Divas main blog page. I could not resist creating a camping themed card with Timberline and the Camper Crazy stamp set. 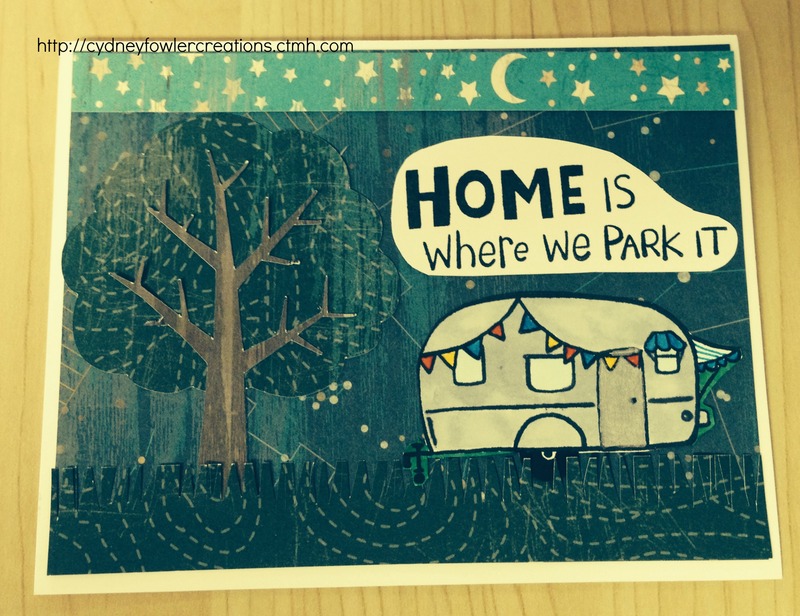 Such cute little RVs and camping sayings in that stamp set. The stars and moon across the top is a zip strip from one of the sheets of paper in the Timberline pack. The pack includes a wood grain sheet I used for the tree and a variety of outdoor themes and patterns including those I used in the card. I colored the camper to look like an Air Stream camper and fussy cut it out using my CTMH micro tip scissors. I “fringed” the bottom strip to look grassy and I “parked” the camper on the grass. Visit my Close to my Heart online shopping site by clicking here to purchase supplies for this project or contact your own consultant. Happy Crafting! Next up on the blog hop is Felicia. Click here to go to her blog to see her Timberline project.